Whether it’s a wedding, prom, homecoming or party, you will want to look 100% fabulous at your special occasion. Its important to make a statement as you walk in, but it’s twice as important to look good in the photos. Classic hairstyles that are constantly beautiful will stand the test of time, and looking back at the photographs will fill you with joy, and not make you cringe! Curly hair is a suitable choice for most occasions, and really says you’ve made an effort! Its very difficult to create perfect curls, so make sure you’ve practiced before hand, or get a friend over to help. If you want sleeker, straighter hair, either go and have your hair blow-dried before the event, learn to work your hair straighteners or invest in some hair extensions for extra body. Going to prom is a memorable and exciting occasion. You’ll want to look like the prettiest girl at prom, with the most gorgeous hair, as well as stunning makeup. Don’t forget to write that checklist, so you don’t forget anything in the weeks leading up to the big event. 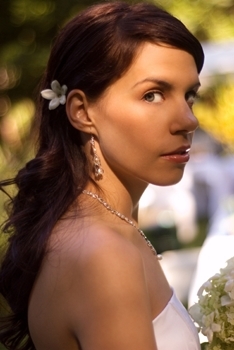 Updo styles are a fantastic choice for those who want to look classic and elegant. Wearing your hair loose with big curls and some simple matching clips can be truly magical. Whatever you choose, make sure you pick something that’s different from your everyday hairstyle, so you really make an entrance! Looking super chic and fashionable is totally important at homecoming. This special occasion has a different dress code in every school, so check out photos of last years’ dance to see what is appropriate to wear. Then you can decide how formal you want your hairstyle. Most likely, a pretty and elegant loose half-up, half-down hairstyle is the best option. Practice curling, straightening and styling your locks before, so it looks perfect the whole evening. And don’t forget the hairspray! There are so many occasions where it’s appropriate to look like a princess. But creating a super complicated updo style with hair accessories is going to take a lot of practice and a lot of extra help. If you know someone who is super amazing at creating gorgeous pin curls and updos, ask them round and see what they can create. Or book an appointment at a great hair salon! Looking elegant on a day to day basis is a tough job. There’s not always time to create anything too complicated, and you probably don’t want to look overdone during the daytime. But, to create different elegant hairstyles each day, make sure you have all the appropriate tools at hand. Flat irons, grips, clips, brushes, ties, bands, combs and hairspray should all be close by to create some super stunning evening styles. Whether you are the bride, the bridesmaid, wedding guest, or mother of the bride, it’s vital to have a timeless, chic hair style. Photographers are waiting, and you’ll want to look back at the albums with pride at having chosen the most beautiful hair style. Something simple, feminine and romantic is a great choice, and will ensure you feel confident and ladylike all day. Going to a party, you’ll want to make an impression on the other guests, and look like you’ve made an effort. Make sure you’ve recently had a good haircut and color, and the rest should fall into place. Accessorize your hair appropriately for each occasion. Sparkly red slides and bows add a festive touch to Christmas party hair, but a cute Alice band might be appropriate for a summer barbeque. A strong edgy hair cut and a good blow dry will be appropriate for a fashion event. Simple, structured hairstyles are fashion forward, the outfit you pick should speak for itself.